Karl Winda Telfer is a senior cultural custodian for his clan countries from his grand fathers tribal lands within the Adelaide plains Mullawirra (dry forest country) Pangkarra Kaurna Meyunna (people) and his grand mothers tribal lands Mullamai (dry food country) Pangkarra in Narrunga Country, Yorke Peninsula. He is a senior custodian of ceremony, story teller, cultural designer, educator and artist. Karl has initiated many innovative bi-cultural projects over many years educating and engaging the wider community through ecological, cultural and spiritual renewal practises and ways of understanding country and First Nations culture. Karl is a knowledge bearer of the peace lore fire of Tjirbruki for which his tribal family group are cultural bearers, having started this work of generational renewal in the early 1980s. Karl brings many people together through ways of understanding the spirit of humanity. He has been invited to speak and share culture at many local, national and international forums. 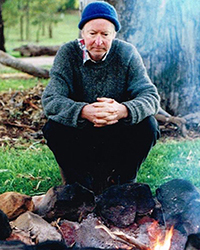 In 1992 he was invited to participate in the Tracking Project, a seven year forum of international educators and Native elders from around the world to design a series of teachings, which connect communities and individuals directly to the natural world. In 1993 Karl co-founded the Tjilbruke Dancers and in 1996 founded the Paitya Dance Group, which interweave Kaurna Palti Meyunna land knowledge systems and culture through language, stories, song, ceremony and ritual. He has shared, presented and represented his culture internationally. He was the inaugural Aboriginal Associate Director for the 2002 Adelaide Festival of Arts where he co-artistically produced and directed the global ceremony of peace, Kaurna Palti Meyunna, in Tarndanyungga/Victoria Square. Karl has collaborated with artists, landscape architects and architects on major public space art and design projects, in particular the Victoria Square Tarndanyangga Regeneration Master Plan with Taylor Cullity Lethlean. He was awarded the President’s Prize by the SA Chapter, Australian Institute of Landscape Architects, for his contribution to public space design. He has been a member of several boards and committees and is currently (2014) a member of the South Australian Country Arts Board and the Adelaide and the Mount Lofty Ranges Natural Resources Management Board. Gavin Malone is a cultural geographer, artist and teacher. He has worked with Kaurna Meyunna for over fifteen years (mainly the Williams family clan) on cultural renewal and presentation, public artworks and exhibitions. In 2002, he and Georgina Williams, Nganki Burka Mekauwe (Senior Woman) Kaurna, held a bi-cultural exhibition, Dislocation, in the Australian Aboriginal Cultures Gallery of the South Australian Museum, and the Living Kaurna Cultural Centre (LKCC) at Warriparinga, 2003-04. He collaborated with Georgina in developing the content of the Interpretive Gallery for the LKCC. Gavin has exhibited throughout Australia in over ninety exhibitions and twice in Spain. His practice includes public space art and design and he has been involved in several innovative projects. He has worked collaboratively with communities, Aboriginal and non-Aboriginal, other artists and design professionals on public space projects ranging from cultural presentation to ecological rehabilitation. He has taught at tertiary institutions since the mid-1990s. For several years, he taught courses in the School of Architecture and Built Environment, University of Adelaide, and the Adelaide Centre for the Arts. He and Karl regularly co-present guest lectures. Gavin graduated from the South Australian School of Art in 1994 and holds a PhD in cultural geography, The Phases of Aboriginal Inclusion in the Public Space in Adelaide since Colonisation. He has published and presented internationally and undertaken study tours in Europe and North Africa as well as extensive travel within Australia.